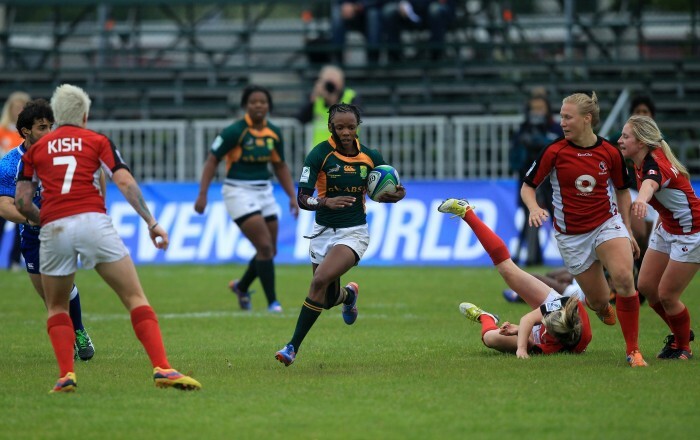 Fifteen Springbok Women’s Sevens players have, for the first time in history, been awarded national contracts by the South African Rugby Union in a significant move towards the 2016 Olympic Games. The 15 players are members of the elite Sevens squad based in Port Elizabeth in a programme supported by the Eastern Province’s Department of Sport, Recreation, Arts and Culture. They include star players Zenay Jordaan, Mathrin Simmers and Veroeshka Grain, who were part of South Africa’s Rugby World Cup Sevens 2013 campaign in Moscow as well as the qualifier for the Women’s Rugby World Cup 2014 against Uganda. “This is a watershed moment for women’s rugby in South Africa,” said SARU Chief Executive Jurie Roux of the contracts which range from five to 12 months. SARU was the first union to award full-time national contracts to the men’s Sevens team in the 2008/09 season, since when the team has delivered consistent results, winning the HSBC Sevens World Series the first year and topping the current standings after victory in Las Vegas last weekend. Rassie Erasmus, SARU’s General Manager of High Performance, was equally excited about the decision to contract an elite group of players and believes it will inspire more women to follow their dream of becoming professional rugby players. “Women’s rugby worldwide has grown tremendously in the last few years and with the inclusion of Sevens rugby in the Olympic Games from 2016 we believe it will be even more popular in future,” said Erasmus. Erasmus was equally delighted about the residential programme, which involves 16 players being housed in Port Elizabeth, as it provides an ideal environment for the players to train and bond off the field. “The residential programme, which was introduced last year, has already started bearing fruit as the SA Select Women’s Sevens team finished as runners up in the Dubai International Invitational tournament in November last year, and hopefully the team will build on that performance this year,” said Erasmus.